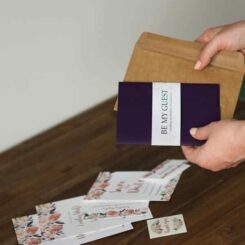 There are a number of different card options available for your wedding stationery to be printed on. Plus, you’re unique, and might want different options to everyone else. That’s why we’ve collated some extra bits and pieces here. Nothing beats seeing the print quality, card and colours of our wedding stationery for yourself. Order a sample pack of wedding stationery or add on a printed proof of your invitation design below.